All-electric squad car makes debut in Pa.
PROVIDENCE, R.I. — Neville Songwe spent hours on patrol with Providence police officers, studying their work habits and even videotaping their practices. But he wasn't training to join their ranks. He was looking for ways to help keep them safe. In a collaboration linking law enforcement and the arts, Songwe used his observations — and creative skills honed at one of the nation's premier art schools — to redesign the inside of a police cruiser to make it more user-friendly and efficient than a standard squad car. The car, billed as the first of its kind, is designed to clear clutter near the dashboard and cut down on distractions by allowing officers to perform a variety of commands without lifting a hand from the steering wheel. “We tried to right a real wrong. We tried to look at making people's life better,” said Songwe, who developed the idea several years ago while pursuing a master's degree in industrial design at the Rhode Island School of Design. 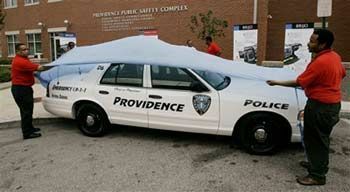 The new model is being tested in a squad car in Providence, with a goal of eventually installing it in all the department's vehicles, said Police Chief Dean Esserman. “It does my heart proud when someone comes here and says they want to help the officers of this department,” Esserman said at a news conference Thursday outside the Providence Police Department, where the car was displayed. Songwe said it costs between $8,000 and $10,000 to outfit an individual police car with his system, called “Brijo” from the names of his mother and father. The central feature is a sleek dashboard where officers can access assorted commands that in conventional squad cars might take more effort. Buttons to adjust the lights, strobes and sirens are attached to the steering wheel. Communicating with dispatch no longer requires an officer to use a hand-held microphone. Dual speakers mounted in the dashboard are designed to improve sound quality. An adjustable keyboard and computer screen are intended to be less cumbersome. The car also includes a license plate recognition camera. Removing equipment from the center of the car could make it easier for an officer to escape if an accident occurs. Songwe came up with the idea several years ago when, as a RISD graduate student, he was walking in downtown Providence and stopped to peek inside a police cruiser. What he saw distressed him. “It somehow just triggered a whole lot of design emotions, design feelings,” Songwe said in an interview. He discussed it with RISD President Roger Mandle, who helped arrange a meeting with Esserman. “How could a police chief not be happy?” Esserman asked. Dawn Barrett, dean of RISD's architecture and design division, said the school's students often collaborate with government entities and private companies as part of their curriculum. “Designers, after all, are always designing for real conditions — and there couldn't be any more real condition than a police vehicle,” Barrett said. Songwe has started a design company, Joneso Design, in Central Falls. He said his goal is for police departments around the country adopt his new model. “It just makes sense,” he said.